Teenager Bobby Kimmel's playground was a record store owned by his father, Jack Kimmel, a bass player for the Tucson Symphony Orchestra. By the time Bobby hit high school in the mid-'50s he began playing guitar with an eye towards a career in jazz, blues, country, folk, or some combination thereof. While performing in coffee houses in the early '60s he met Linda Ronstadt, a young girl barely in high school at the time, living on Tucson's outskirts near the Davis-Monthan Air Force base where B-29s flew overhead, the deafening sounds an odd sort of music to her ears. They became friends and did some singing together, then he left town while she stuck around and finished school. Linda's talented family had an obvious influence on her eventual career. Her great-grandfather, Frederick Ronstadt, emigrated from Germany to the state of Sonora, Mexico, in the 1830s. Grandfather Federico Ronstadt had a passion for opera and became an orchestra leader after moving to Tucson in the 1880s, some 30 years before Arizona became a U.S. state. Aunt Luisa Espinel was successful during the '30s and '40s performing Spanish folk songs. Her father, Gilbert Ronstadt, once had a chance to sing with top-tier bandleader Paul Whiteman but turned down the offer. He often performed at the Fox Tucson Theater as Gil Ronstadt and his Star-Spangled Megaphone, his act sorely dated by the time Linda was born in 1946; later he ran a hardware store. As a teenager she performed with older siblings Peter and Suzy as The Three Ronstadts; they joined Bobby Kimmel and banjo player Richard Saltus, playing around town at one point as The New Union Ramblers. Kenneth Edwards, a guitarist, mandolin player and summer '64 Venice High School graduate, met Bobby Kimmel when the two were empolyees at McCabe's Guitar Shop in Santa Monica, California. Bobby suggested they form a trio with Linda, who had planned to move to folk music's epicenter, Greenwich Village. But with L.A. so much closer than N.Y., she arrived in early '65 ready to do whatever it took to avoid having to take a "regular" job. Blues great Charley Patton's "Pony Blues," his first recording for Paramount Records in 1929, inspired the group's name, The Stone Poneys (an edgier moniker than most folk acts of the era). They split the rent three ways on a beach house in Santa Monica and found enough work (at the Insomniac in Hermosa Beach and other night spots) to manage to keep from being evicted. Mike Curb, who had produced instrumental band The Arrows for his Sidewalk label ("Apache '65" was the first release), recorded with the Poneys and Arrows guitarist Davie Allan, but the results didn't make it to vinyl. Still, word was getting out about this group with the barefoot, miniskirted teenage lead singer, and they began appearing at the higher-profile Troubadour in West Hollywood. 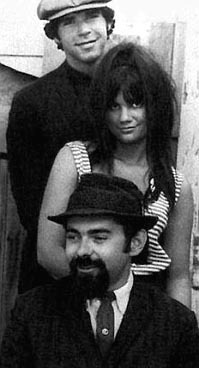 Their manager, Herb Cohen, had little faith in the trio but was sure he could get a recording contract for Ronstadt; when Nick Venet of Capitol Records showed interest, she insisted on all three or no deal. Venet signed the Stone Poneys and got them into the studio in late 1966. "All the Beautiful Things," written by Kimmel and Edwards, a straightforward folk song in a Peter, Paul and Mary mold, was promoted to radio in January 1967; the single and self-titled debut album attracted virtually no interest from radio or record buyers. "One For One" (written by Al Silverman and later country-rocker Austin DeLone), the first single from the group's second album, Evergreen Vol. 2, had a mellow folk-rock vibe more suited to summer 1967 goings-on; it too was ignored. The next single, "Different Drum," was recorded under what Linda felt were dubious circumstances. Mike Nesmith had written the breakup-themed folk song in 1965 prior to joining The Monkees; a year later, bluegrass band The Greenbriar Boys did a version for Vanguard Records. The Stone Poneys had planned to do an acoustic remake but on the day of the session Bobby and Kenny were banned from the studio; Linda recorded the song with a full complement of studio players including a string section and harpsichordist. The change was abrupt, the experience stressful; disappointed by what she considered a "horrible" performance, she had mixed feelings of excitement and embarrassment when hearing the song on the radio for the first time. 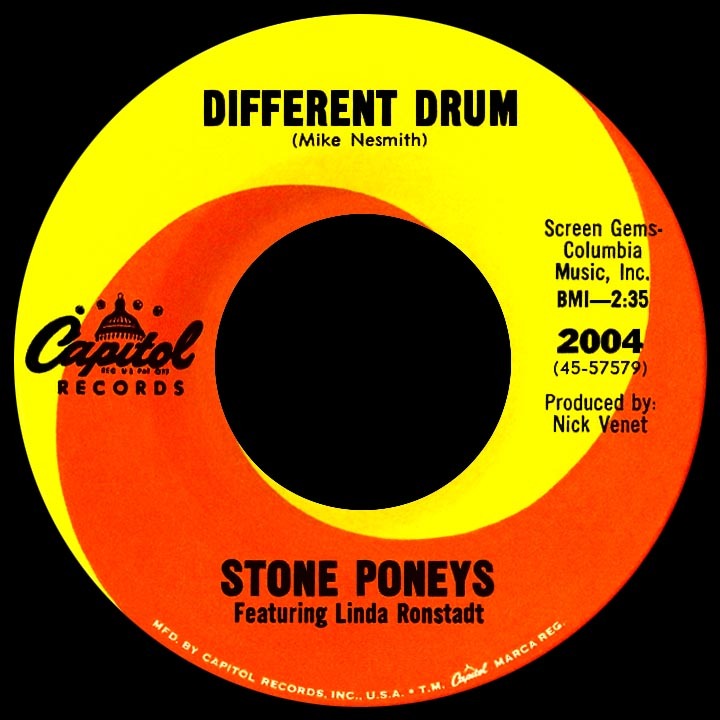 Credited to Stone Poneys featuring Linda Ronstadt, "Different Drum" took local radio by storm that fall, hitting number one in Los Angeles in mid-November just as it was starting to take off nationally, where it took longer to develop, hitting the top 20 at the end of December and spending several weeks there until February '68. Millions of music fans heard something in Linda's voice that she couldn't yet appreciate, but she was happy, at least, to finally be getting some notice outside the coffee houses of Southern Cal. The downside was that the Stone Poneys were on their last legs, regardless of what Kimmel and Edwards had to say about it. Shortly afterwards Mike Curb released a 45 on Sidewalk containing the songs from the '65 session he'd produced. "So Fine," a rockish remake of The Fiestas' 1959 hit written by Johnny Otis, had a folkier flip composed by Kimmel, "Everybody Has Their Own Ideas." Nothing happened with this record or, for that matter, anything Linda recorded for Capitol, with or without Bobby and Kenny, for the next few years. 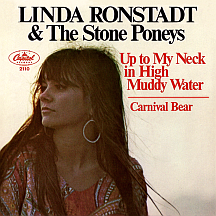 "Up to My Neck in High Muddy Water," written by Frank Wakefield, John Herald and Bob Yellin of the Greenbriar Boys, was billed as Linda Ronstadt and the Stone Poneys and slipped onto the charts for just a couple of weeks in the spring of '68. 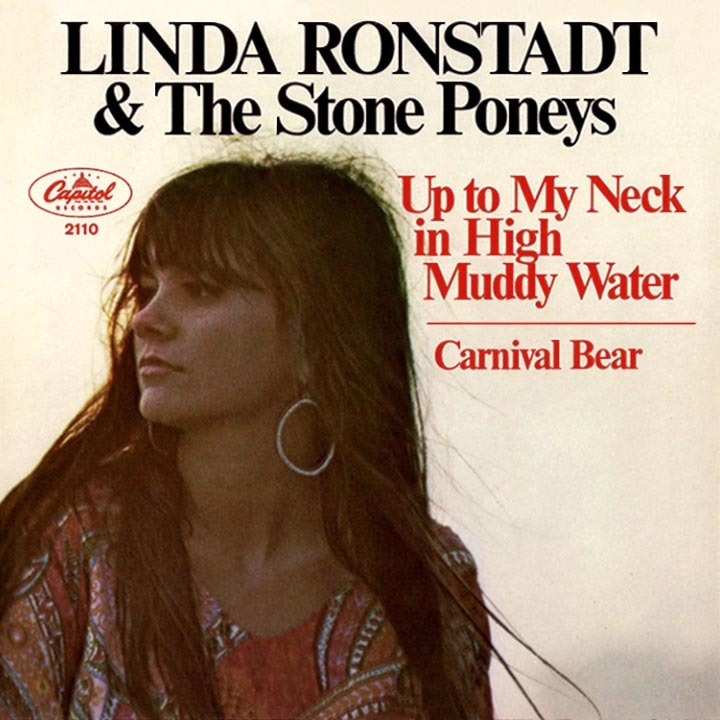 The third Stone Poneys album was primarily a Ronstadt solo project per Capitol's preference; Stone Poneys and Friends Vol. III utilized a varied lineup of musicians (the back cover showed a large group shot: Linda with 25 people, two dogs and a cat) with songs written by Tim Buckley, Steve Gillette, Laura Lyro and Nesmith, whose "Some of Shelley's Blues" was the next single. Kenny Edwards left the group and extra musicians were hired for a tour with The Doors; then Bobby Kimmel called it quits and Linda was on her own, a somewhat hesitant solo act. Her first album sans Stone Poneys was released in early 1969 with Chip Douglas replacing Venet as producer. Hand Sown...Home Grown struggled as earlier albums had, but Capitol stayed the course and in 1970 she scored her first solo hit with L.A. songwriter Gary White's ballad "Long Long Time." The next few years were nonetheless difficult and she left Capitol in 1972, signed with Asylum in '73 and made one more album for Capitol in '74 to satisfy the terms of her contract. That album, Heart Like a Wheel, featured a game-changing production of Clint Ballard's "You're No Good," first recorded by Dee Dee Warwick in 1963 and a hit for Betty Everett in early '64; Ronstadt's remake unexpectedly hit number one in February 1975. Over the next five years she racked up hit after hit with remakes of rock and roll classics by the likes of The Everly Brothers, Buddy Holly and the Crickets, Martha and the Vandellas, The Miracles, Roy Orbison, Chuck Berry, Doris Troy and Little Anthony and the Imperials. Over the next three decades, Linda Ronstadt excelled in a variety of genres including pop, country, folk and Spanish music, even taking to the Broadway stage in 1981 in Gilbert and Sullivan's The Pirates of Penzance, a hundred and one years after the show's initial run.